The 2011 Family Health Survey (FHS) provides information on key family planning indicators including the contraceptive prevalence rate (CPR), contraceptive method mix, and contraceptive users by background characteristics such as age, education and socio-economic status. The CPR is defined as the percentage of currently married women of reproductive age (15-49) reporting current use of any method of contraception. Acquiring knowledge about fertility control is an important step forward in gaining access to contraceptive methods and using a suitable method in a timely and effective manner. Although year-to-year variations are not significant, the CPR has exhibited a generally increasing trend (Figure 1). In the late 1960s and early 1970s, fewer than two in 10 married women used any form of contraception. Contraceptive prevalence rate rose during the late 1970s. By 1993, two in five women were practicing contraception. Since the mid-1990s however, a fairly steady figure of 45 to 50 percent of married women of reproductive age have been reported using some form of family planning in successive Demographic and Health Surveys and Family Planning Surveys. Fluctuations in the CPR can be attributed to the erratic trend of the prevalence rate of traditional methods. In contrast, the prevalence rate of modern methods had generally increased. In 2011, the prevalence rate for modern methods was 13 times the estimate for 1968, which was 2.9 percent. In the 2011 FHS, the pill was the leading contraceptive method with 19.8 percent of currently married women reported they are currently using this method (Figure 2). Ligation or female sterilization (8.6 percent), withdrawal (8.2 percent) and calendar method (3.7 percent) were the next three most commonly used methods. Injectables was used by 3.4 percent of currently married women; IUD, by 3.1 percent; and male condom, by 1.2 percent. Vasectomy (male sterilization) and those classified under Natural Family Planning Methods such as Lactational amenorrhea method (LAM), and Standard Days Method (SDM) were each reported by less than one percent of currently married women as their current contraceptive method (Table 1). The proportion of women using oral contraceptives has generally increased over the last 15 years with notable increase between 2006 and 2011, wherein the prevalence rate of oral contraceptives increased from 16.6 percent to 19.8 percent. The proportion of women using other modern methods has been nearly constant since 1995. In particular, the use of ligation or female sterilization was almost constant at about 11 percent from 1996 to 2003, dropped in 2004 and 2005 to 9.4 percent, then rose in 2006 to 10.4 percent and dropped again in 2011 to 8.6 percent. The percentage using injectables slightly increased from 2.8 percent in 2006 to 3.4 percent in 2011. About four in ten (37.5 percent) of currently married women in the oldest age group (45 to 49 years) were still using contraceptives in 2011. The prevalence rate for modern methods was higher than for traditional methods for all age groups of currently married women (Table 2). According to the 2011 FHS, the contraceptive prevalence rate (CPR) ranged from 23.5 percent in the Autonomous Region in Muslim Mindanao (ARMM) to 56.3 percent in Davao Region. Modern or more effective methods were more likely to be used than traditional or less effective methods in all regions (Table 3.4). ARMM had the lowest prevalence rate for modern methods (19.1 percent). Educational attainment and contraceptive use are correlated; that is, women with higher educational attainment are more likely to be using any form of contraception than less educated women. Regardless of their educational attainment, women preferred modern contraceptive methods over traditional methods. With the exception of women with postgraduate education, oral contraceptives were the most commonly reported contraceptive method; ligation, the second most popular method. Among women with postgraduate education, ligation was the most popular method while oral contraceptives were the next commonly used method (Table 2). 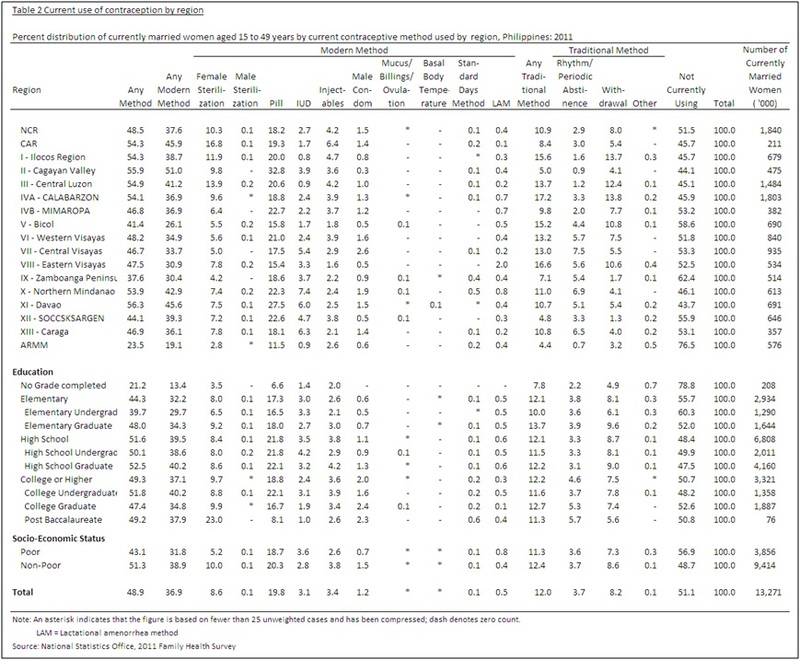 The 2011 FHS provides contraceptive prevalence and method mix by socio-economic status (SES). A household is classified into either “poor” or “non-poor” thru the use of proxy variables or the presence of household conveniences and ownership of vehicle or vehicles. Table 2 shows that the overall CPR for all currently married women belonging to non-poor households was higher by 8.2 percentage points than the CPR for currently married women belonging to poor households (51.3 percent versus 43.1 percent). This difference is due mainly to a much higher prevalence of female sterilization among non-poor women than among poor women (10.0 percent versus 5.2 percent). Modern methods were more widely used than traditional methods regardless of the socio-economic standing of the women. Use of modern contraceptive methods by both the poor and non-poor women has been generally increasing during the past rounds of FPSs. It is also important to note that the gap between the CPR for modern methods between women by SES has been closing over time and this gap has not widened since the implementation of the Contraceptive Self-Reliance Strategy, that is, when the aide for supplies of family planning methods was withdrawn by donors. A scrutiny of the distribution by contraceptive method, of women in poor and non-poor households shows that, overall, oral contraceptives were the most popular contraceptive method for both the poor (18.7 percent) and non-poor (20.3 percent). The 2011 Family Health Survey (FHS) is a nationwide survey designed to provide information on fertility, maternal and child health, family planning, maternal and child mortality, and other health-related concerns in order to assist policymakers and program managers in evaluating and designing strategies for improving health and family planning services in the country. The 2011 FHS updates findings from the series of Family Planning Surveys conducted from 1995 to 2006, and various rounds of the National Demographic and Health Survey. The survey was designed to provide data representative of the country and its 17 administrative regions. The 2011 FHS involved interviewing all women who are 15 to 49 years of age in the sample households. These women were asked questions about some of their background characteristics, the children they have given birth to, use of family planning methods, antenatal and postnatal care received during pregnancy, vaccinations received by their children, and other valuable health-related information. The classification of a household to indicate its socio-economic status was done by the National Statistics Office based on the responses on the presence of household conveniences, that is, a household was assigned a score that will indicate its socio-economic standing. Household conveniences include electricity, radio or radio cassette, television, landline telephone, cellular phone, washing machine, refrigerator or freezer, CD/VCD/DVD player, component or karaoke, personal computer, and gas stove or gas range. Vehicles include tractor, motorized banca or boat, car/jeep/van, motorcycle or tricycle and bicycle or pedicab.